Tired of seeing snakes in your yard? If so, stake a claim to your property and drive snakes away with the Solar Snake Repeller. Unlike poisons & traps, the Solar Snake Repeller uses safe technology. Every 30 seconds, audible sound and vibrations are emitted from the unit in all directions. The combination of sound and vibrations will repel snakes up to 650 square metres. The Solar Snake Repeller has an internal Ni-MH battery that recharges during the day so you can continue to be effective throughout the night. When fully charged, this economical device can operate for up to 7 days without another charge. You'll never have to worry about checking or replacing batteries! Your Solar Snake Repeller is ready for use! 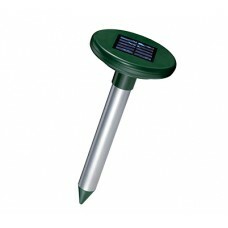 Easily remove and re-install the Solar Snake Repeller while doing lawn maintenance. You cannot find an easier, more humane technique to rid your property of snakes! For best coverage, it's recommended two units be installed within 30m of each other.